Do not miss another Mothercare voucher! 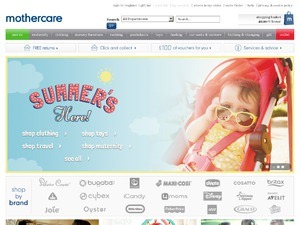 Simply leave your e-mail address and we'll always keep you informed of new vouchers for Mothercare. Offer condition: Cannot be used in conjunction with staff discount, childcare/nursery discounts or any other promotion, discount voucher or code. Cannot be used in conjunction with save 15% when you spend £100 at mothercare. This voucher cannot be exchanged for cash, and may not be used to purchase gift vouchers/cards or to purchase the following toy brands: TP, Little Tikes, Saber, and Plum. This voucher also excludes baby entertainment such as bouncers, rockers, swings, activity stations and walkers. All products are subject to availability. Mothercare and Early Learning Centre reserve the right to withdraw any products, promotional offers or this voucher at any time. Rotherham store excluded. This voucher cannot be used in any concessions (including without limitation Clarks) or at photography studios located in Mothercare or ELC stores. Postage and packaging charges are additional and not subject to the discount. These terms and conditions are governed by English law and you submit to the exclusive jurisdiction of the English courts. Offer condition: The offer entitles the user to 15% off when they spend £100 or more on qualifying items online at Mothercare. The 15% offer will be applied to the basket once £100 or more of qualifying items have been added. This offer is valid until Sunday 3rd November 2013 (inclusive). This offer cannot be used in conjunction with any other offers, discount or voucher codes, staff discount, or to purchase Babyzen, Be Safe, Boori, Bugaboo, Cosatto, Cybex, Babystyle Oyster, Medela, Plum, Silver Cross or TP branded products, Britax Dualfix Car Seat, Mothercare Branded Nursery Furniture, Moses Baskets & Mattresses, products with free/discounted items (Pushchairs/Tutti Bambini Nursery Furniture), gift vouchers, baby milk, nappies or medicines. This offer is non transferable, and should not be sold on auction sites for profit. Postage & packing fees are not subject to the 15% discount. Offer condition: This voucher/voucher code cannot be used in conjunction with any other voucher/discount code, or in conjunction with any free car seat offers, or with Mothercare and ELC staff cards or with childcare/nursery discounts, in concessions or to purchase reduced price items, baby milk, baby medicines, nappies, Bugaboo, Philips AVENT Natural, TP or Plum products and gift vouchers/cards. This voucher is not transferable and should not be distributed to the wider public. Offer condition: This voucher/voucher code cannot be used in conjunction with any other voucher/discount code, with Mothercare and ELC staff cards or with childcare/nursery discounts, in concessions or to purchase baby milk, baby medicines, nappies, Bugaboo, TP or Plum products and gift vouchers/cards. This voucher is not transferable and should not be distributed to the wider public. Voucher codes should not be sold on auction sites for profit or reproduced on any website. P&P charges are not subject to 10% off discount. Offer condition: This voucher/voucher code cannot be used in conjunction with any other voucher/discount code, or in conjunction with any free car seat offers, or with Mothercare and ELC staff cards or with childcare/nursery discounts, in concessions or to purchase reduced price items, baby milk, baby medicines, nappies, Bugaboo, Philips AVENT Natural, TP or Plum products and gift vouchers/cards. This voucher is not transferable and should not be distributed to the wider public. Voucher codes should not be sold on auction sites for profit or reproduced on any website. P&P charges are not subject to 10% off discount. Offer condition: Cannot be used with Bugaboo, or in conjunction with other vouchers. Offer condition: Excludes Bugaboo, nappies, milk and gift cards.This voucher/voucher code cannot be used in conjunction with any other voucher/discount code, with Mothercare and ELC staff cards or with childcare/nursery discounts, in concessions or to purchase baby milk, baby medicines, nappies, Bugaboo and gift vouchers/cards. This voucher is not transferable and should not be distributed to the wider public. Photocopied or defaced vouchers will not be accepted and should not be sold on auction sites for profit or reproduced on any website. P&P charges are not subject to 10% off discount. Offer condition: Start Date: 22 November at 2pm. Excludes: Gift vouchers, Baby Milk, o medicine, Bugaboo products, nappies, all toys during a 3 for 2 event, a small number of products cannot be discounted further because they are already at a special price. This is clearly stated in the red dotted box on the product page online at mothercare.Not to be used in conjunction with any other discount codes. Offer condition: Exclusions: Any products already reduced in the Offers section, Gift vouchers, Milk, Medicines, Bugaboo, TP, Plum, Axi, Selwood, Saber, Mix & Match Nursery. Offer condition: Exclusion: Gift vouchers, milk, medicines, Bugaboo, TP, Plum, Axi, Selwood, Saber, 3 for 2 Items, Mix & Match Nursery Offer, ELC toys. Offer condition: Can not be used in conjunction with any other offer. I just bought two car seats that are usually £149.99 each. They were on offer for £99, Mothercare offered 10% off plus free delivery during Bank Holiday weekend and now this!!! Saved me an extra £20 and the total came to £159.98 for TWO seats. Yeay!!!!!! Worked a treat..but wont give me free delivery even though I bought over £100 of cot! This is fantastic! i was sent vouchers via the mothercare baby and me club, but none were suitable for the purpose i intended, i used this code and saved over £50, Thankyou very much!!!!!! 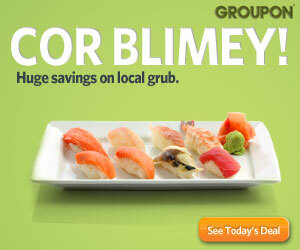 I used this code and saved £25 - Bonus!! Latest voucher code valid at a time of promo publication was entered to be working from 2016-04-21.